Reading and Writing Redhead: How Google™ Slides Can Help Your Students Practice Grammar! How Google™ Slides Can Help Your Students Practice Grammar! 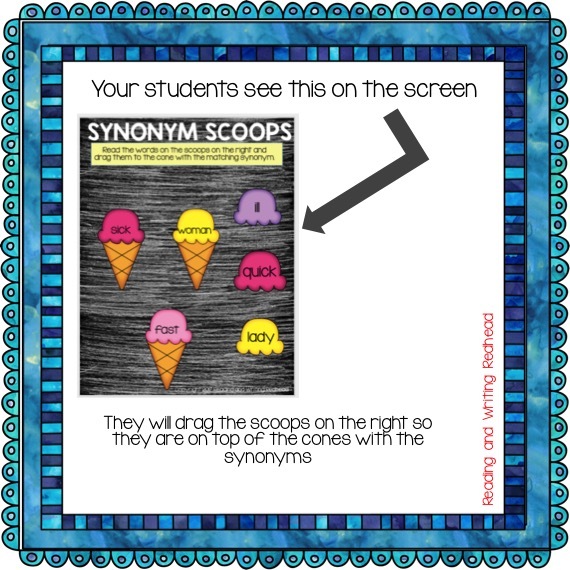 Mini-Lessons, small group practice, interactive notebooks, and watching videos are just a few ways students can practice grammar skills such as synonyms, antonyms, and homophones. There are also some great games, task boxes and reading centers that can be done in small groups or partners. But often, if you really want students to practice grammar, they need to do so individually and worksheets often provide the most targeted practice. What if you want to incorporate technology? As of now, apps to get your students practicing are few and far between and the quality is often not terrific. Also some apps I have tried are too challenging for second graders. Apps also are not always engaging for kids. The solution? Using Google Classroom or just Google drive or digital products for which you only need a url. 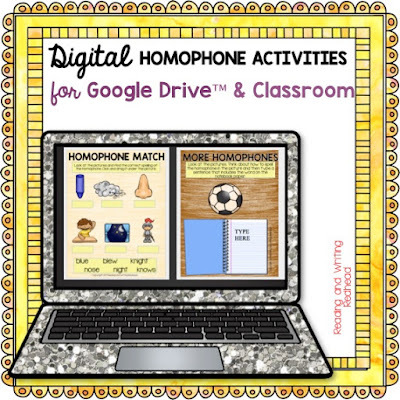 There are ways digital resources can help students practice antonyms, synonyms, homophones and more! With digital creations made for Google Drive, a teacher needs a Google account and her students usually need their own Google accounts (for example all the students in my district grades 2 and up have Google accounts). Sometimes, students can use a digital resource without logging into a Google account, such as with this product from Erintegration: Google Forms Interactive Math Story. I tried it at home and it was terrific! However, some resources like this give you a shortened url to click or type in, such as a bit.ly, but some school districts block shortened urls such as bit.ly. Make sure when looking at a resource that you understand how it is going to work and if your students will be able to access it on the school network. 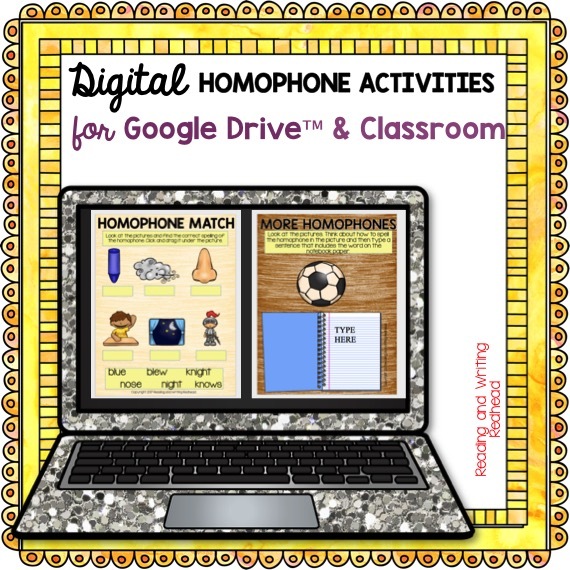 Since my students already have Google accounts, I prefer resources that go right into their Google Drive. Here is generally how they work. For something like Eat Pray Travel Teach's End of the Year Memory Book, when you purchase it, you download a PDF from Teachers Pay Teachers. That PDF provides instructions to you as to how the product works and what you need to know. It also will contain a link (clickable or copy and paste) to a Google Slides product (or sometimes another type of Google Product). You make sure you are signed into your own Google account and click the link .You either will be forced to copy the Slides so you get an editable copy, or you will see a copy that is "View Only", so you will need to click "File" and then "Make a Copy". It's easy -> My second graders can do file and make a copy with no problem! Then you need to either share the document with your students (or if you are in Google Classroom, easy to assign it - Alice Keeler has terrific explanations like this one) or place it in a shared folder - here is an explanation if you're a real newbie. So let's take a look at how a Google resource might actually work once it has been assigned or shared with a student. This is a walk though of my Digital Homophone Activities. If you prefer images to videos, these are the image from the product preview which show you some screen shots. 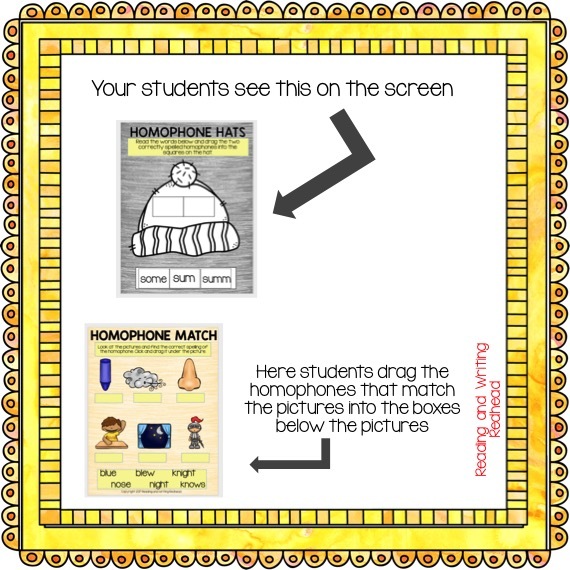 Here it shows you that students see a homophone hats page. You can peek at the student directions which instruct them to move the two correctly spelled homophones from the bottom of the screen to the hat. 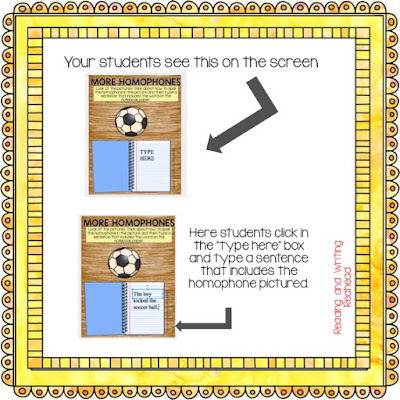 With the bottom activity, students look at the pictures and click and drag the homophone below the picture. So for example, under the picture of the nose, students would drag the word "knows". 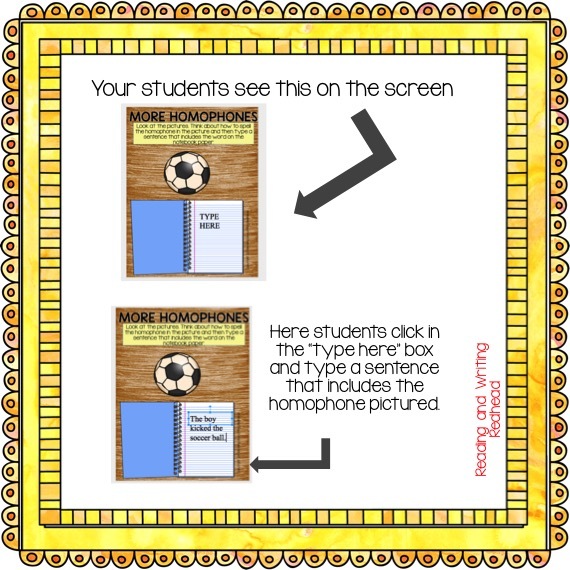 On the slides below students will look at the picture and type a sentence where it says "TYPE HERE" that includes the homophone pictures. For example for the ball, she typed "The boy kicked the soccer ball". For younger students, like my second graders, I prefer straightforward activities, and in Google Drive, that will include a good amount of clicking and dragging of moveable pieces which you will need to model first. First click, then you can drag. I also emphasize the UNDO button (looks like a curvy left arrow) because young kiddos (and older ones too) will accidentally flip moveable pieces upside down, make them huge or tiny, delete them, etc. The undo button is a lifesaver! Also, young elementary students can even type words or sentences in a text box. Occasionally they will accidentally delete the text box because of distracted clicking but that UNDO button will solve it! 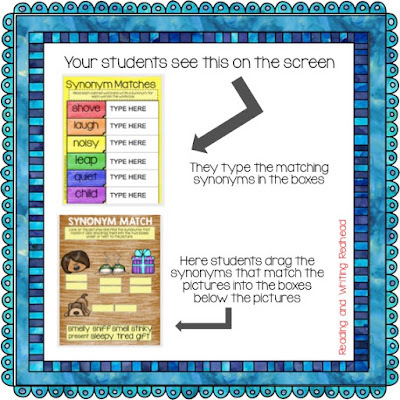 Here' a peek at what two different activities involving movable pieces look like in this walk through of my Digital Synonym Activities. Here is a peek at some of the images from the preview on TPT. With digital resources that involve several different activities like those above, you may want to assign just a few slides at a time, or if you're feeling adventurous and your students are up to it, they can try all of them at once. I always give the disclaimer though, that digital resources are in no way a substitution for good instruction. 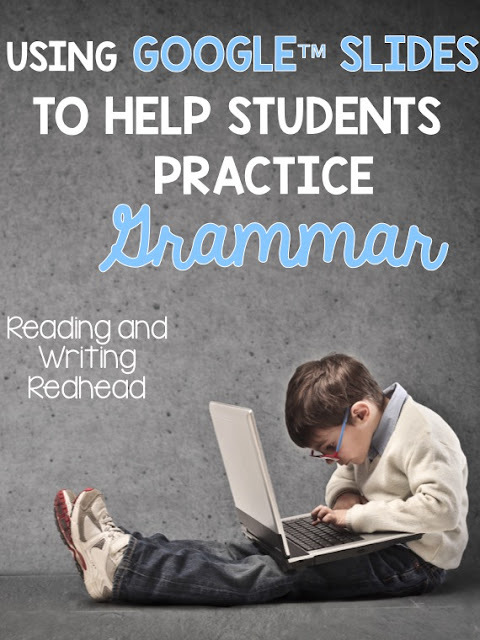 You need to preteach and do mini lessons and other activities with all grammar skills. Google and other digital resources are great for practice and review but will not do it all. 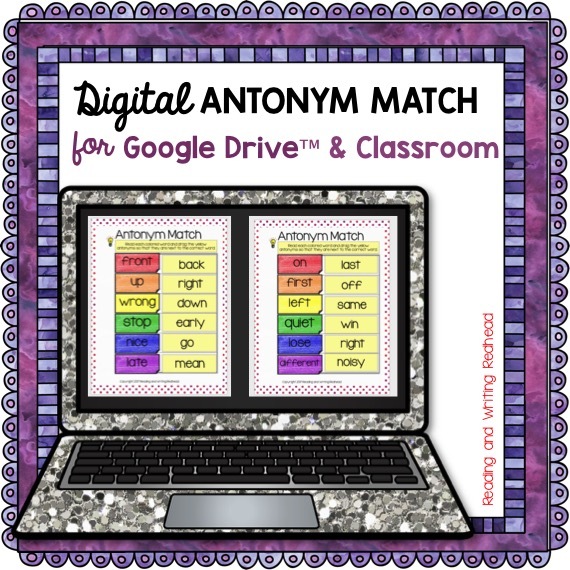 Finally, here is a peek at a short (only a few slides) Digital Antonym Match activity . I will be adding more slides and activities to it over July 4th so the price will increase but right now it's super bargain priced. It will also get renamed to Digital Antonym Activities. 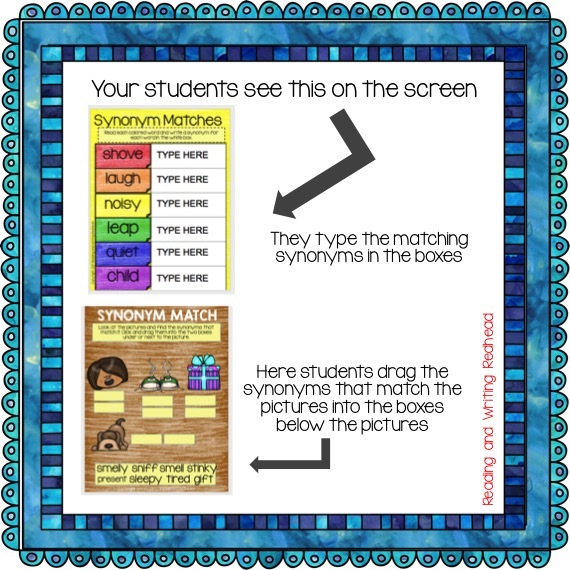 Students click and drag the correct antonym so it is matched up next to the rainbow colored antonyms on the left side. Easy peasy! Here's the video walk though from Youtube! I will be putting together more blog posts about digital resources so don't hesitate to ask questions and comment! I'd love to know what you need help with and what you want to know! I also want to share with you some of my favorite TPT creators who have digital resources available for elementary school. Head to their store and see if they have the keyword Google or Digital on the top left, or type in the search box for their store to find some great resources!